The Emoji craze is sweeping the nation and Crayola has joined the fun with their new Emoji Maker. My boys are 6 and 8 and they love adding Emoji's to their conversations. 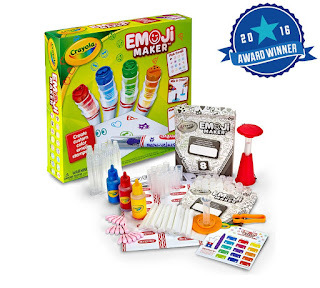 The Emoji Maker is recommended for ages 6 plus and allows for hours of creative and fun play. You actually create your own stampers. 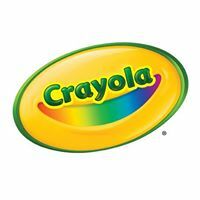 Ink is included in the 3 basic colors red, blue and yellow so you can create any color you like by mixing. You get 16 different markers so that's 16 different color varieties you can make and 16 different Emoji tips. The different types of Emoji's included are any face you can imagine, a dog, a cat, paw prints, hearts, flowers, eye balls and even pizza. The boys wanted the cat to be black and it was really fun watching them try to mix the colors to get close to black. It actually came out kind of a dark brown so we made the cat dark brown and did the same for the dog and paw prints. We also were able to make a very pretty purple color for the flower by mixing blue and red. I had almost forgotten how to mix colors it made me think how old mommy is getting. I have two girls that would enjoy this! My 6 year old little girl would absolutely LOVE this!